This photo was taken on July 11, 2017 at 4:35 AM. The location being in Washington DC, near the Georgetown area. The "Take it!" moment came as I had seen similar signs before, but never waiting by one while dark. This time, the darkness did help add some fright to the the sign. The fun of this photo is in the play on the word "cross" and it's many meanings - one that includes being upset or angry. Thus my call upon this definition which is not what the actual sign intends. No wonder English is such a difficult language to learn - lol. 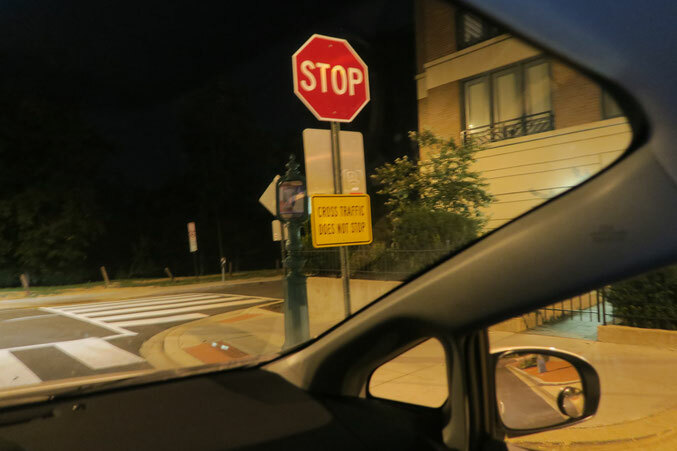 The After Take: Should you encounter this sign - pay the above no mind - just be certain to watch out for traffic in the intersecting street from all ways, before proceeding. Wishing each of you safe travels as you make your way in this often confusing world. Man it looked really really dark in the background, no moon, no stars, just black. I still use that word, with my grandkids. This picture has a very ominous feel to it. I can't stand those types of intersections. We have one here by our house that by all accounts should have a 4-way stop light, but instead they just have a 2-way stop and the main vein doesn't stop. Poor suckers that don't know the area end up waiting 10 minutes to make a right turn. My son has one of those exact signs in his house. He took it when it was being replaced and put it in his hallway because his kids are constantly storming up and down the halls. What kind of car do you have Bruce? You may have shared it before on the site but I only discovered you guys about 6 months ago.